Come aboard, matey, and scratch and sketch an adventurous life at sea. But beware the pirates may set you free or they may force you to join the crew! Aaaar! Sail off into the days of pirates as you uncover their wicked ways and their treasure with the handy wooden stylus. 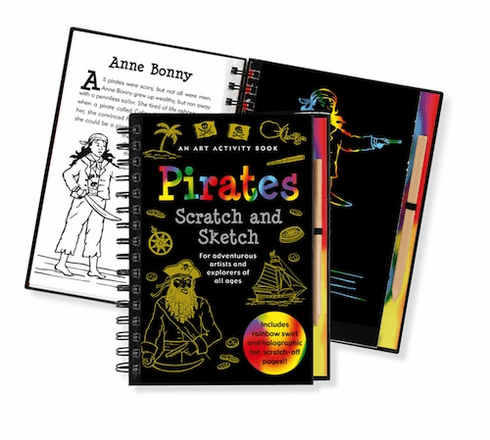 Learn about these scourges of the sea as you copy 20 simple sketches of the world's most famous pirates, their ships, weapons, flags, and more Just scratch away the black coating on the pages and discover the swirls and glitter that appear in your artwork like magic treasure. Ages 8 and up. Shrink-wrapped with a wooden stylus for drawing on black-coated paper to reveal colors beneath. 64 pages. Includes 20 scratch-off, 20 illustrated, 20 sketch pages. 6-3/8" wide x 8-1/2" high; wire-o bound hardcover.